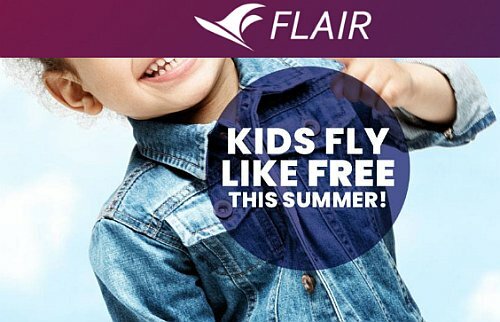 Flair Air is having a unique sale, where they are claiming that kids 'fly free' for the rest of June and the month of July. But is it actually as amazing of a deal as it sounds? - Kids aren't actually free, the taxes and fees still apply. - The discount is available for available for flights from June 12, 2018 – July 31, 2018. - The promotion ends at midnight CST on June 14, 2018 or until seats are sold out. At check-in at the airport, ages will be verified. - If the passenger does not present with the children, the discount will no longer be valid. Passengers will be responsible for the difference in fare or will be denied boarding. And the cost of carry-on luggage, just like the taxes and fees, won't be free for kids either. Vancouver to Calgary - works out to $172 CAD roundtrip per passenger, as opposed to $218 CAD roundtrip if only adults are flying. A good price, but this is pretty similar to the $161 roundtrip flights in July that were available from Flair earlier this month. Edmonton to Vancouver - works out to $172 CAD roundtrip per passenger, as opposed to $218 CAD roundtrip if only adults are flying. Pretty decent for July travel, although July flights have been as low as $149 CAD roundtrip with WestJet this year. Calgary to Kelowna - works out to $150 CAD roundtrip per passenger, as opposed to $178 CAD roundtrip if only adults are flying. Again, pretty decent, but Calgary - Kelowna flights have been available for $139 CAD to $160 CAD roundtrip for July travel. Toronto to Edmonton - works out to $303 CAD roundtrip per passenger, as opposed to $470 CAD roundtrip at current prices if only adults are flying. It would seem to be a significant discount over current prices, and actually about $60 cheaper than the cheapest they've had available for July travel this year. Overall I would say most prices work out to about the same, or close to the same price level as the lowest prices that have been available this year for July travel. You have to keep in mind that when airlines have promotions like this, often times, they have bumped up their prices first, before offering the discount. As always, you need to be aware of what their prices have been like throughout the year, before believing their 'amazing deal' marketing claims. These are still some very good prices, especially for July travel, but I wouldn't say that children are really flying for free. It's more just a creative way of marketing a similar discount that has been available from Flair (and WestJet or Swoop, as they attempt to compete with Flair) at various times in 2018. 3. Click on the 'I Agree' button when the terms and conditions box pops up. 4. Choose your origin, destination, dates, number of of adults, and number of children. 5. Before you hit the SEARCH FLIGHT button, you need to click on the 'Validate Promotion' link, or the discount won't work.